At Jack Brown, we’ll celebrate just about anything… like holidays that may seem a little odd to outsiders. But our customers love the savings they get on dry cleaning and other services. We love our Wacky Holidays; like when February’s National Laugh and Get Rich Day rolls around and you all pop in laughing it up; or when you come by to wish us a Happy Birthday in June; or give us your best pirate impersonation on Talk Like a Pirate Day in September; and of course, we love when you reap the rewards of our Black Friday specials. 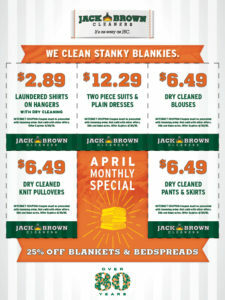 So the next time you see a Wacky Holiday coming up at Jack Brown Cleaners, mark your calendar — because it’s time to have fun and save!